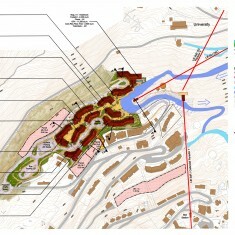 Ecosign has been involved in the master planning of the Village development at Sierra Nevada since 1990. 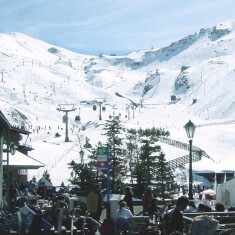 The main village at Sierra Nevada was constructed in accordance with Ecosign’s design concept during 1993 to 1995 in preparation for the 1996 World Alpine Ski Championships. Due to the steep topography of the site, the village was built on top of a four level parking structure with 3,000 stalls which provides parking for overnight guests, day skiers and employees. 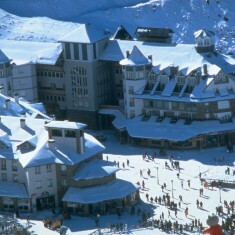 The village consists of two hotels and four apartment buildings containing 900 units and 3,240 beds and 10,400 m² of associated commercial and skier service space. The success of the new village spurred associated developments on private lands. lan consists of 12 buildings on a 7 hectare site above the main village. The new village will provide 3,000 warm beds and 14,600 m² of skier service, conference and commercial space. The two villages will be connected with a Cabriolet lift which will have two intermediate stations to link developments at four elevation levels.